Apperley Bridge Station, Bradford, was part of the wider West Yorkshire Rail Growth Package, an integrated package of rail enhancements in the Leeds City Region. 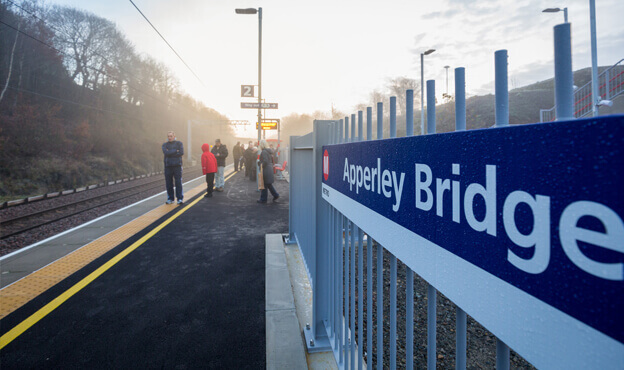 Apperley Bridge was one of two brand new stations Spencer Group built on the Bradford Forster Square – Leeds route. This was a design and build contract for a brand new station, the former station at Apperley Bridge having closed in 1965. A 2 platform station was created, with a 300 space car park adjacent and ramp facilities throughout to make it fully accessible. This was in addition to a new access road from Apperley Lane, a pick-up and drop off point, bicycle parking and shelters, CCTV surveillance, passenger information displays and a public address system. 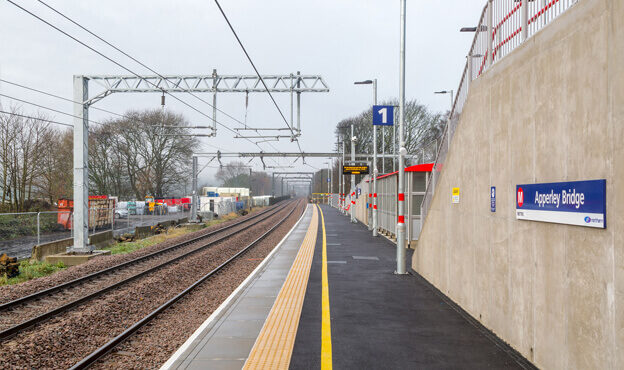 Hoarding was erected alongside the railway line to create a high street environment to work in while maintaining normal service during the works, and the station’s first train departed on Sunday 13th December 2015. The station was shortlisted for Station of the Year at the 2016 National Transport Awards, with former transport secretary Patrick McLoughlin praising Spencer Group for our efforts. He expressed the importance of the new station in ‘helping to connect businesses and communities, create jobs, and make it easier for people to get around’. This reflects the opening of the station creating a key link between the neighbouring cities of Leeds and Bradford, as previously locals had to travel to one or the other city by car or bus. Currently the station has one train an hour in each direction on the Bradford to Leeds line, with the potential to increase capacity if passenger numbers grow.